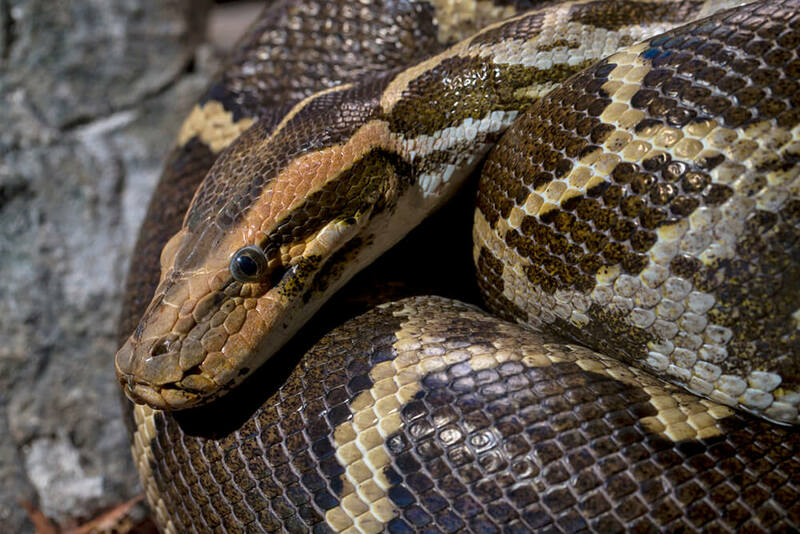 Pythons, boas, and anacondas: what's the difference? Giant snakes capture our attention as stars of monster movies. None of these huge snakes are venomous or evil. 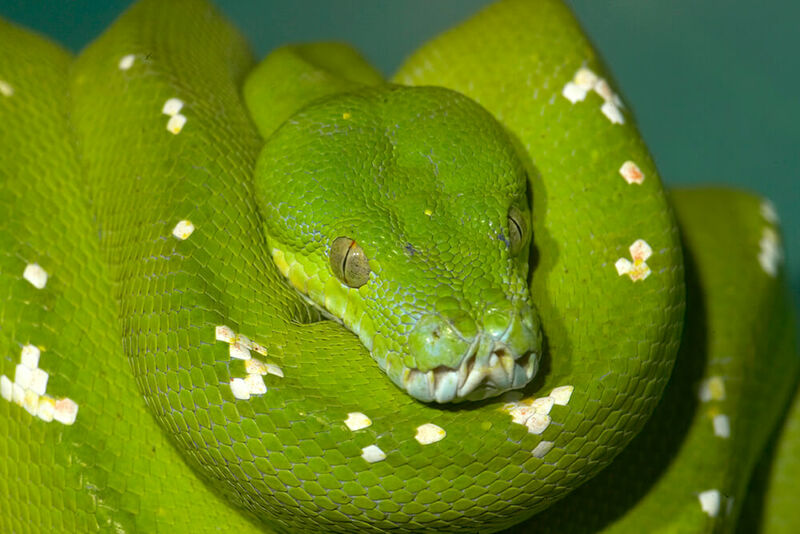 Reticulated pythons, boa constrictors, and anacondas are some of the biggest snakes in the world, and many people get confused about which is which. The first thing to note is that the anaconda is a species of boa, not a separate type of snake. That leaves two groups: the pythons and the boas. These snakes are constrictors, killing their prey by wrapping around it and suffocating it. And they are considered primitive snakes with two lungs (most snakes have only one) and the remnants of hind legs and pelvic bones. But they have differences, too. Pythons have one more bone in their head than boas do and some additional teeth. And pythons are found in the Old World (Africa, Asia, Australia) while boas live in both the Old World and the New World (North, Central, and South America). But the biggest difference is that pythons lay eggs while boas give birth to live young. Because of their bulk, pythons move by traveling forward in a straight line, which is known as "rectilinear progression.” This is accomplished by stiffening the ribs to provide support, then lifting a set of ventral (on the belly) scales and moving them forward so the loose ends grip the surface, pushing the snake ahead. This type of movement works on the ground as well as in trees. Pythons can’t move very fast though—only about 1 mile per hour (1.6 kilometers per hour) on open ground. But since they don’t have to chase their food, they don’t really need to move quickly. Pythons have predators. Small, young pythons may be attacked and eaten by a variety of birds, wild dogs and hyenas, large frogs, large insects and spiders, and even other snakes. But adult pythons are also at risk from birds of prey and even lions and leopards. The snakes are most vulnerable after a large meal, when they are less inclined to move quickly. 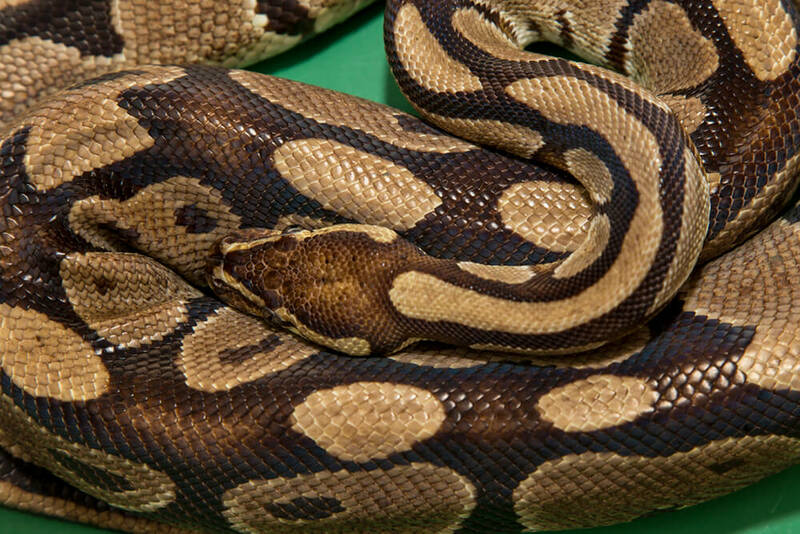 If threatened, some pythons roll into a ball and tuck their head in the coils; other python species may try to escape, get into a striking, or “S”-shaped, position, or use their constricting power if grabbed. Pythons can be difficult to find and watch long enough to learn their habits. They are found in rain forests, grasslands and savannas, woodlands, swamps, rocky outcrops, desert sand hills, and shrub lands, depending on the species. Pythons may be active day or night, depending on species, habitat, and when prey is most active. Most pythons seek shelter in tree branches or hollows, among reeds, in rocky outcrops, or in abandoned mammal burrows. Two exceptions are the woma and the black-headed python, the only pythons known to create their own burrow by digging with the head and scooping out the dirt by curving their neck. Their jaws are countersunk, lower jaw fitting inside the upper jaw, which keeps dirt out of the snake’s mouth. Like most snakes, pythons don’t chase after their prey. Instead, they are ambush hunters. They use both sight and smell to locate prey. Pythons also have an additional advantage: most have special temperature-sensitive "pits,” or holes, along their jaws that can sense the heat of a nearby animal. This helps them find warm-blooded prey even in the dark or among dense foliage. The python is a constrictor. It grabs its prey with its teeth, then quickly wraps coils of its body around the prey and squeezes. The python doesn’t actually crush the prey and break its bones, though. 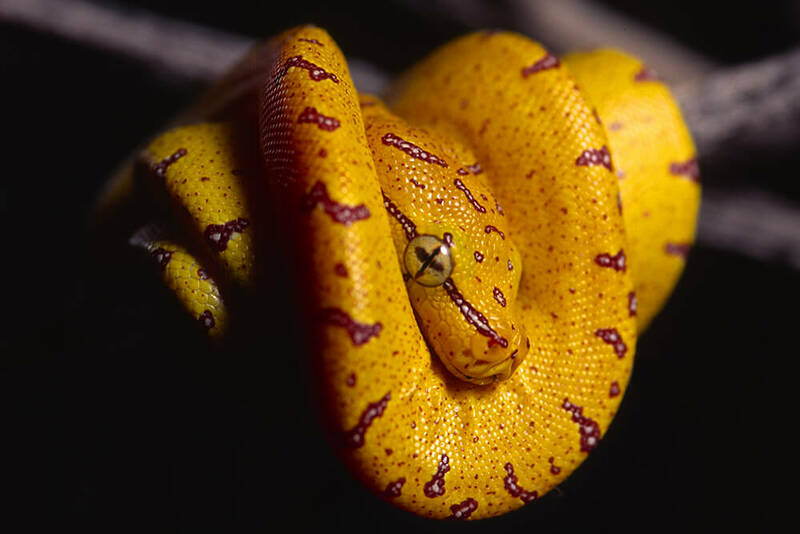 Instead, it squeezes tightly so that the prey animal can’t breathe; each time its prey exhales, the constrictor tightens its coils to take up space, causing suffocation. The python can also feel the prey’s heart beating, so when it stops, the snake knows it is safe to release its coils and begin to eat. The snake then begins the leisurely process of unfolding its jaw and swallowing the prey whole, usually head first. The skull’s joints are able to flex and fold along with its extremely pliable skin to maximize the mouth space, allowing very large food items to pass through its esophagus. This is accomplished with rhythmic muscular contractions that pull the prey down the snake’s throat and into its stomach. How does the snake breathe while its mouth is full? It has a special tube in the bottom of its mouth that stays open to one side to take in air. If this all sounds grotesque, think about the feeding behavior of a pride of lions—the python’s method is much less messy! Constrictors are able to minimize the stress of their prey and injury to themselves by using this fast and efficient method. Depending on the size of the snake, pythons may eat rodents, birds, lizards, and mammals like monkeys, wallabies, pigs, or antelope. One rock python was even found to have a small leopard in its stomach! Once the meal is consumed, pythons look for a warm place to rest while their food is digested. Arboreal pythons have unusually longer teeth than their ground-dwelling kin. This may help them penetrate through the feathers of birds. Their tail is also extremely prehensile, allowing these snakes to launch three quarters or more of their body at prey during a strike. At the San Diego Zoo, our pythons are offered thawed rodents and rabbits. Unlike their close relatives the boas, pythons lay eggs. Some species lay them in a shallow nest or even cover them with leaves and soil. But what’s really remarkable is that most python mothers stay coiled around their eggs to protect them while the eggs develop; if the temperature gets too cold, the mothers of larger species warm their eggs up by "shivering.” This involves rhythmic contractions of the muscles and is described as looking like the snake has the hiccups. This is known as thermogenesis. Even though snakes are ectothermic, the mother python can, amazingly, raise the temperature of her eggs a few degrees by doing this. It takes a lot of energy, though, so she may not reproduce again for two to three years as she gains back the weight she lost. After the eggs hatch, she leaves, and the babies are on their own. The San Diego Zoo has had pythons in its collection since its earliest days. One of our most famous python residents was a reticulated python named Diablo, which arrived from India at 23 feet (7 meters) long and weighing 200 pounds (90 kilograms)—quite the show stopper! 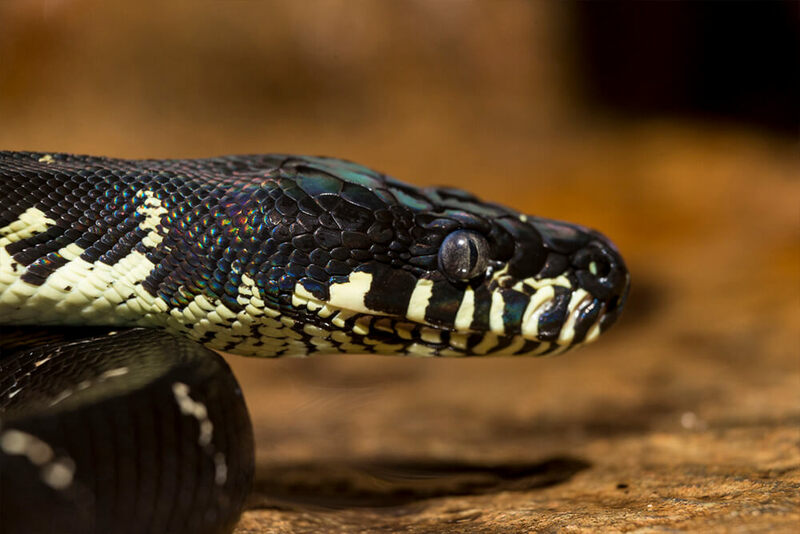 We currently have six python species on exhibit in the San Diego Zoo’s Reptile House, including colorful Boelen’s pythons in the northeast corner of the House and Indian pythons in the northwest corner. Zoo guests can also admire one of our albino Burmese pythons living along the Zoo’s Tiger Trail. Burmese pythons’ typical coloration is brown, tan, and black, but the albino variation lacks those color pigments, and the snake is white with a yellow pattern. In the wild, albino snakes rarely survive because both predators and prey can spot them more easily, but they are striking to look at in zoos. Four python species serve as animal ambassadors, used by our Education Department for presentations to school groups and tours. They include another albino Burmese python named Saffron, two young woma brothers (hatched here in 2007) named Mickie and Nooroo, a Madagascan ground boa named Manja, and Monty, a ball python. These gentle and beautiful creatures allow our guests to view pythons up close and touch them, helping to dispel the myth that snakes are slimy and scary. The San Diego Zoo Safari Park has a ball python that serves as an animal ambassador, as well. Nyoka (Swahili for “snake”) is one popular guy. He travels all over the Safari Park, the city, the state, and even the southwestern United States, helping to spread the word about the need for conservation and the dangers of the pet trade. 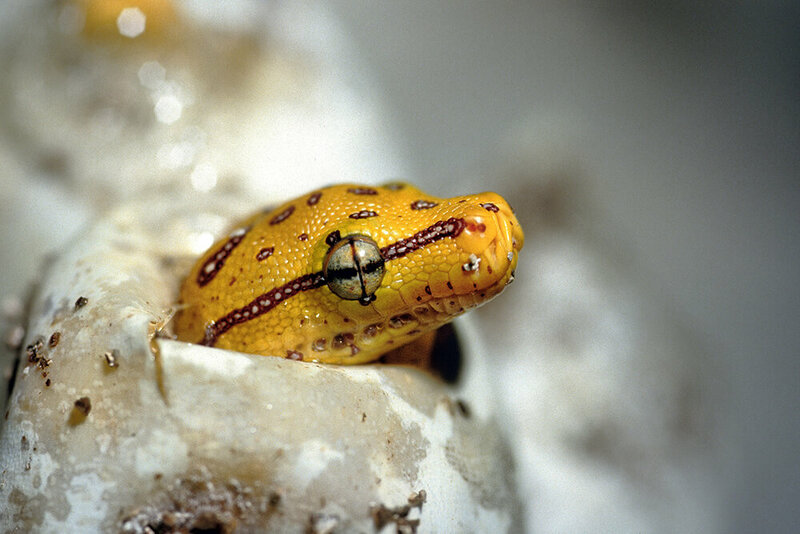 His docile nature and years of experience being photographed and touched by the public has made him one of the Park’s favorite reptile celebrities. Many people in Asia, Australia, and Africa live closer to pythons than they think, as the snakes often use backyards, basements, and roofs as their habitat. Pythons may also live on or near farms or gardens, where rodent species are abundant. Some people appreciate the pest control pythons provide, but others consider the snakes to be the pests and kill them on sight. Pythons are often run over on purpose while sunning on or crossing a road. In Asia, pythons are killed for folk medicine uses and as a food source, and the larger python species, particularly the Indian python, are killed for their beautiful patterned skin, which is used for clothing and apparel. In Australia, pythons are a protected species, although many are illegally taken from the wild to support a growing trade in pet pythons. And pythons everywhere suffer from loss of habitat. Pythons have four rows of back-curving teeth in their upper jaw and two rows of teeth in their lower jaw that they use for obtaining, holding, and moving prey back into the esophagus. Black-headed pythons seem to prefer eating other reptiles, including venomous snakes. Reticulated pythons have been seen swimming in the ocean, which is probably how they originally got to the islands in the Pacific Ocean, where some of them now live.